The Château de Goult, is an exceptional property situated in one of the most beautiful and unspoilt villages of the Luberon, Provence. Come and experience the beauty of 900 years of history in the heart of the Luberon. You will cross the ages: from the 12th century tower through the Salle des Gardes of the 14th century to the Main Façade and Grand Staircase of the 17th century. 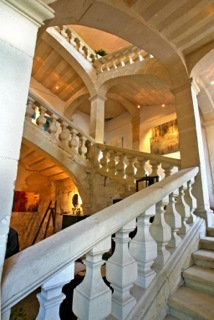 The Château offers over 1000 squarer meters/11,000 squarer feet steeped in history. "Le Château" : 7 bedrooms including 2 suites have found their natural place with a more contemporary comfort. The Château can accommodate 14 people. "Le Loft de la Tour" : An independent space, adjoining the Château, which can accommodate up to 6 people with its own fully equipped kitchen. The Loft can be rented on its own. Le Château de Goult is a truly unique setting, perfect for relaxing holidays or productive work.